I like graffiti that makes a statement. If I can get a literary reference out of the deal I’m more than half way home. It’s juicy to chew on some thought while experiencing rampant vandalism. It’s feels like a pyrrhic victory. Off the top of my head I can’t tell you the book but I know this slogan appeared in a Kurt Vonnegut novel. I know this even without having read his books since my teenage years, because he used the phrase often in the book. Seeing it on this traffic warning sign is oddly comforting. I’m not sure how it relates to the cul-de-sac being sealed off by the guard rail, but it feels like a vague philosophy of life, especially if you spend any time in the area that surrounds Columbia Blvd. A quick internet consultation revealed that the line is from the book Slaughterhouse Five and that the saying relates to existentialism, one of the greatest of all the “isms,” next to bagism of course. How great does it get to look across Columbia Blvd and see a Johnny Lydon lyric from the PIL song Rise spray painted on the trailer of a semi-truck?—that being a rhetorical question, I don’t expect an answer, but I have to say I find it oddly inspiring. The rig seems inoperable or I would find even more inspiration in imagining this semi traveling across the country giving people in traffic a chance to read and contemplate Lydon’s words. For now it’s a message tucked away that I peek at when I’m heading down Columbia Blvd. Not necessarily a specific quote from anyone besides the odd rebellious peasant or serf from back in the day, this plain message spoke to me. I found it somehow ironic to be plastered on the side of a crumbling shed. The exclamation point is a nice touch. Seeing this enroute to Woodlawn Elementary School, I had to wonder if it was giving the kids any ideas. I found comfort in knowing that they’re not that organized. This message jumped out on us in the dark of night down by the frog wetlands past Linnton. It sure seems to be the kind of quote that I would liked to have heard from Gandhi or Martin Luther King Jr or at the very least Muhammad Ali. After finding out it’s from a Crass song it makes more sense as a punk sentiment. Having anything to do with fighting could hardly be related to a message of nonviolence. It’s enough of a song or slogan to inspire legible train graffiti. Considering words on trains made me wonder why freight cars are never employed as a means of being moving billboards. It could only have something to do with trainspotting never really catching on. I’m back to my Oregon Decal obsession and until I find out otherwise, I’m convinced it all started with the green heart in the state boundary design. I’m working on tracking down the creator of this image which really shouldn’t be too hard but my self-imposed deadline is approaching and I’m still planning on one more part to this series before I exorcise this obsession from my consciousness. The last blog post was titled Oregon Decal Spawn Part 1, or some such title, which in hindsight seems terrible so I reworked the title based on what these decals have become to me—something of an obsession. While maybe a casual obsession, they’re images I’m focused on collecting. A snapshot is satisfying enough, the need to possess some tangible remnant of these decals hasn’t over taken me. I have only seen a few of these decals for sale which means tracking them down would have proven impossible. While on my bike my eyes scan the bumpers of parked cars. The state outline usually jumps out at me. After considering whether the design is something I’ve seen before I either stop and grab a picture or keep pedaling. I’m surprised by the number and variety of designs that represent all manner of Portland and Oregon related subjects. 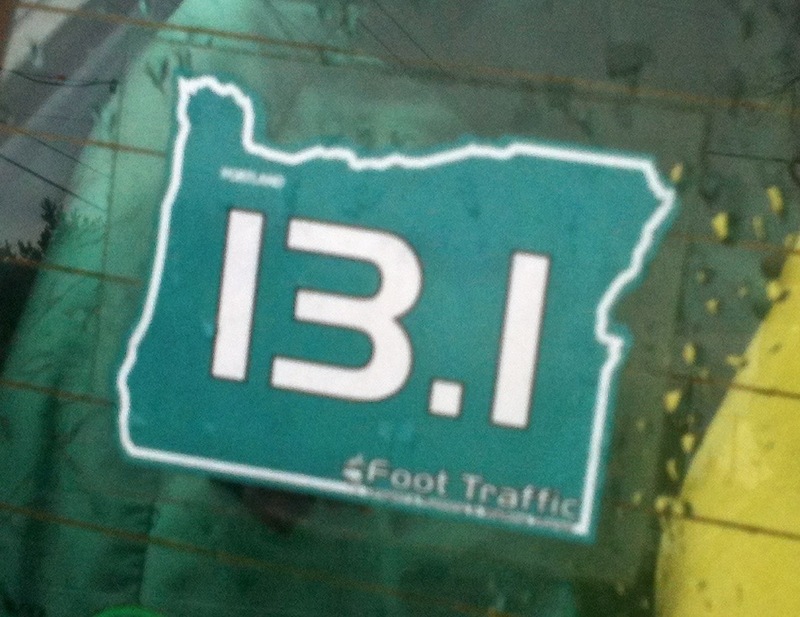 I want to think that as Portland-centric as we are, a Portland border would be a far more specific and authentic a representation, in some cases, of this sticker concept. There’s only one problem. 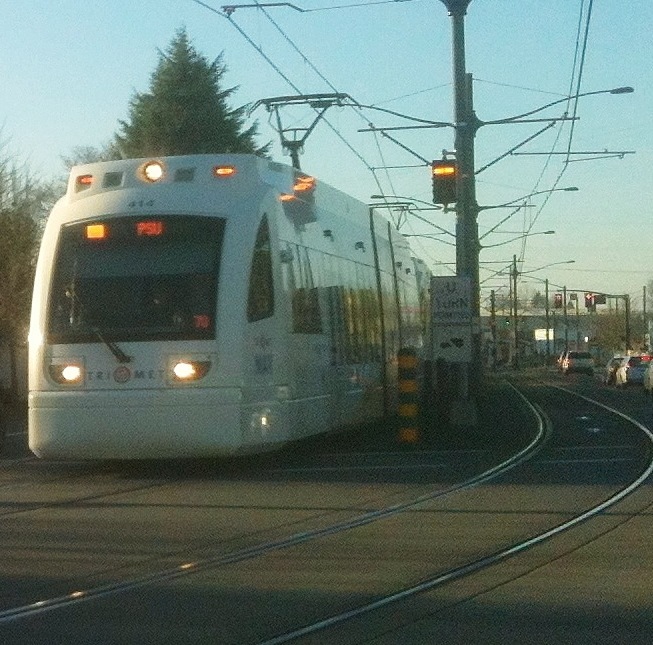 The Portland city limits prove to be a design flaw mess. No one would recognize it and it would never work as a decal outline. Portland: Not a decal inspiring border. Last summer I ran into Rob Campbell who is among other things a T-shirt designer. He showed me a T-shirt design which incorporated the use of the Oregon border. This got me blabbing about my Oregon decal obsession. I asked him why he thought so many people use the state to frame designs. He was succinct when he explained that it’s “effective.” And that makes sense. As I pointed out before, people immediately know the image involves regionalism, whatever the symbol happens to be, sometimes it’s not clear, but it’s stuff in this state or even something being promoted specific to Portland. Regardless, it makes for an eye-catching decoration for a car bumper or anywhere else it gets stuck. Why not love Portland? Again if you slapped these words on top of the city limits map it wouldn’t look right so the use of the state border. Everyone knows there’s a city named Portland in Oregon. It’s greek to me, except it’s not Greek, it’s Latin. It’s the Latin translation of the state motto which when translated back into English is: “She flies with her own wings.” Who knew you could get a lesson in history and Latin from a sticker. This one is saying all kinds of things about Portland. It references the White Stag sign, mentions old town and frames it with an eye catching golden state border. The quality of the photo does it no justice but this vehicle owner is loving Portland. These two seem like homemade designs. The stripes, rays of sun maybe, made me think of Arizona. 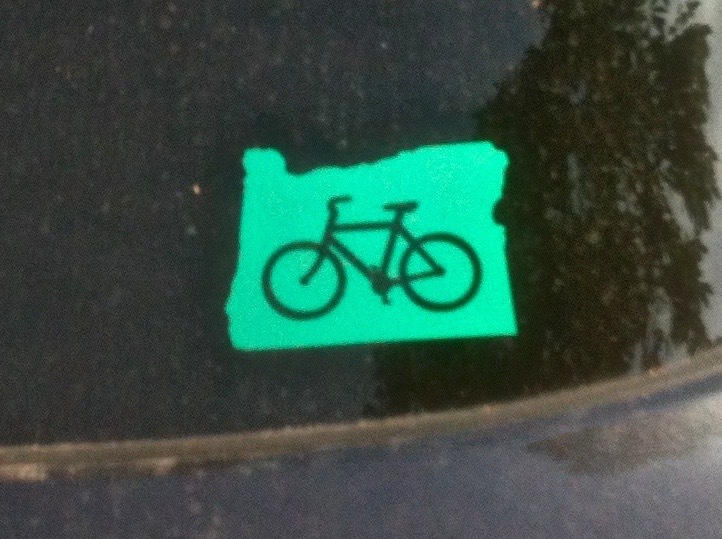 The other sticker looks like a basic art project with the tiny blue heart sticker marking Portland’s location on the pink state map. Every Portland sports team does the Oregon decal with gusto. Thorns, PSU Vikings, and Rip City! 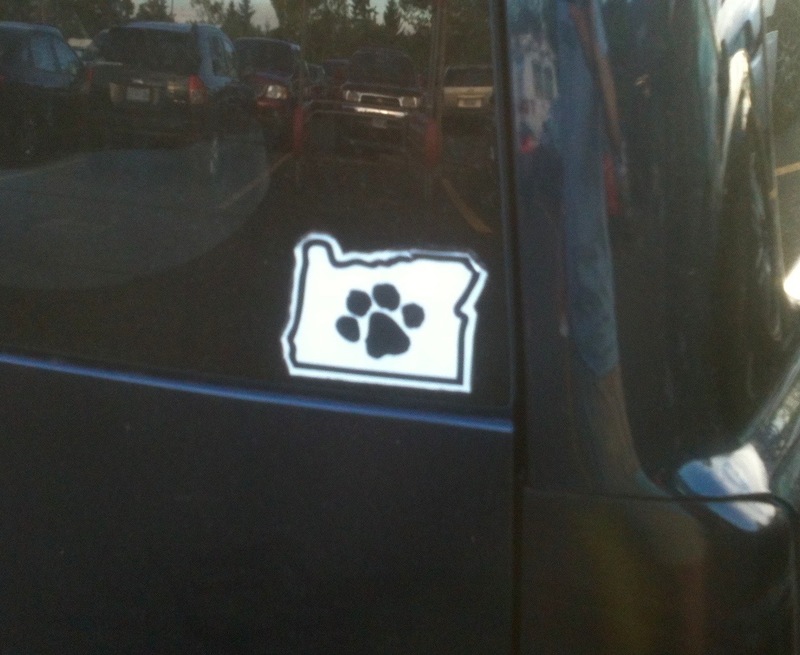 Any kind of advertising receives a boast with a state of Oregon decal design. Northside shoes were founded in Portland. The little heart is a nice touch and for whatever reason the state is depicted as dripping, or is it oozing? Even Pabst ran like a stallion/unicorn with an Oregon design for their Pabst music festival. And yeah, Portland and Oregon have a few tea drinkers. Well, no one can exactly advertise snow but it’s another mix of borrowing an advertising slogan and mixing it with a state decal. Even Bernie Sanders gets in on the act with an Oregon inspired reminder to vote for him. Do we have bees and bartenders or martini makers in this state? According to these decals, we do! This one doesn’t make me groan. I could not resist that lame pun. 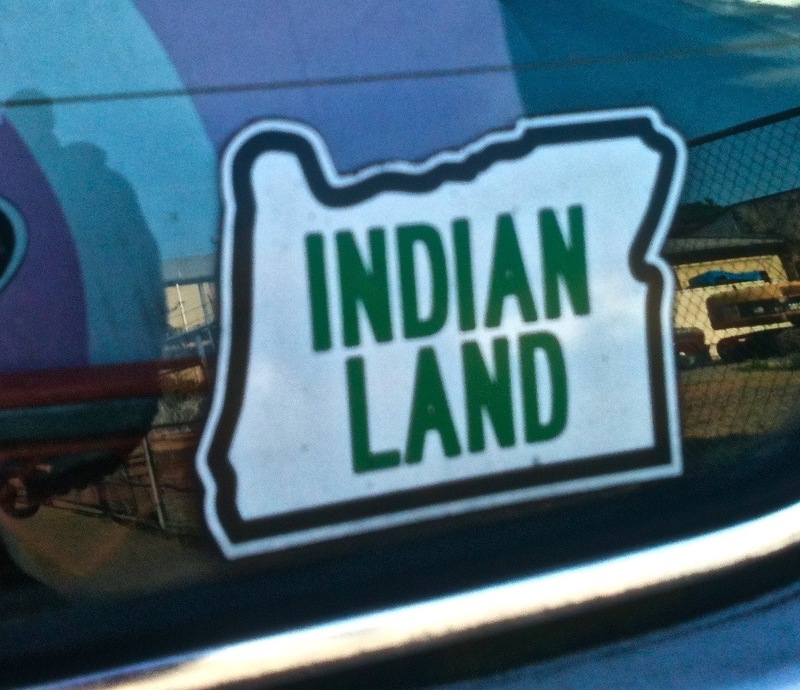 It’s seems like a statement about farming or it insinuates that the owner of the car is a native Oregonian. It could well be there as a show of support for local farming or hauling around vegetables. Other decals offer identifiers by way of symbols. We run half marathons, love animals, depending on the foot print, crabbing and ride bikes. It can all be spoken in decal. This one speaks for itself. It has one of the best uses of the Oregon border since it serves as a reminder of the original inhabitants of these parts. Gotta run to look over more car bumpers. The obsession will rear it’s ugly head again in this blog soon enough. Note to Mrs. Yuchmow: I feel the need to justify my use of the word “and” to start a sentence. I know you taught Will Simmons from the Pittsburgh Orbit that this usually isn’t a good thing to do but in the case of my usage it needed to happen. 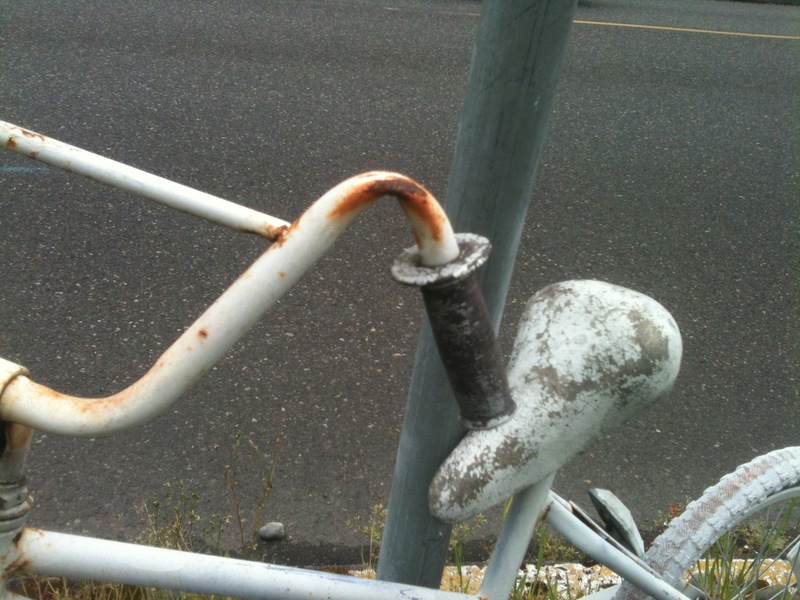 It gave me pause, the white bike, a familiar object, alone and riderless, chained to a street sign. 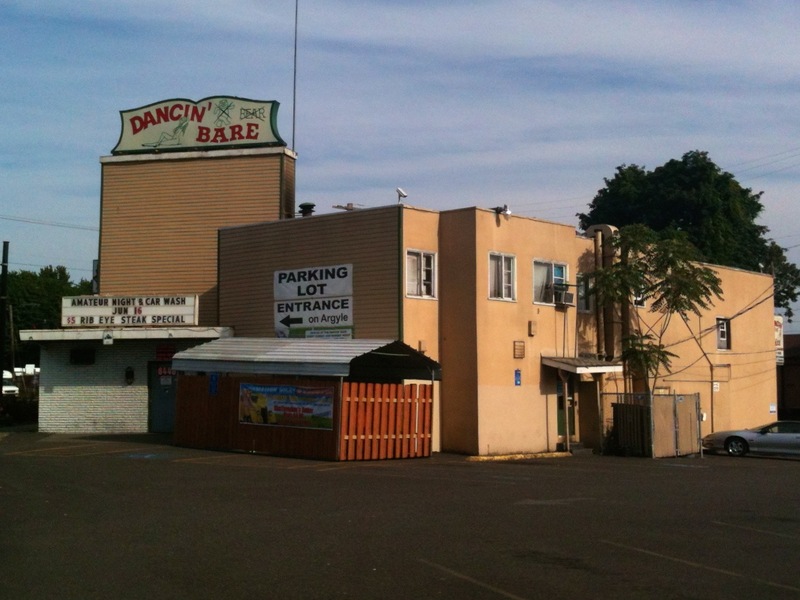 I noticed it last spring while cruising up and down Killingsworth Street on my way to substitute teaching jobs. The nickname “ghost bike” came to mind. It seemed to only represent tragedy, an accident, death. It implied that something awful had happened at that spot with the bike serving as a reminder. The Internet was full of links to information and photos. Still I hung back from researching. I wasn’t ready to dig in. 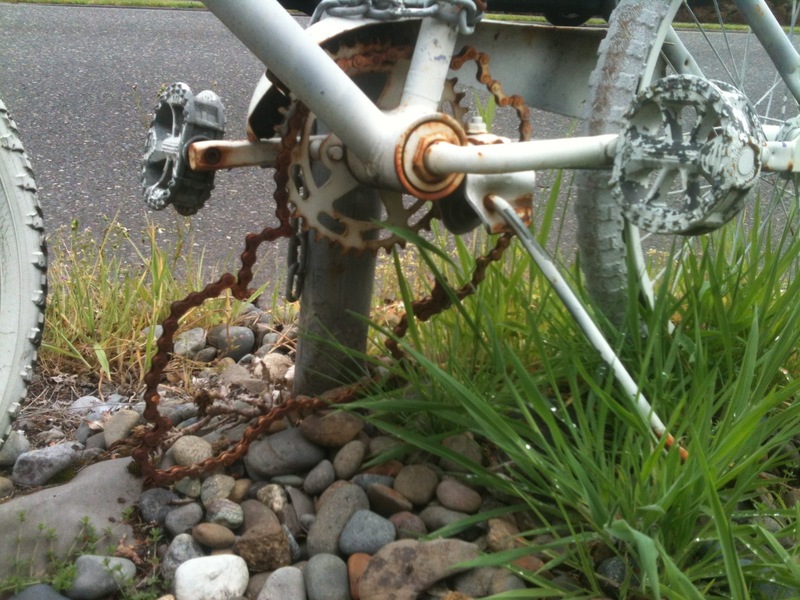 When we moved to Portland we had an avid bike riding neighbor. I’m more of a commuter type, but this guy went on long bike rides around town. He mentioned having had a couple of intense bike accidents. I began to expect the same fate. 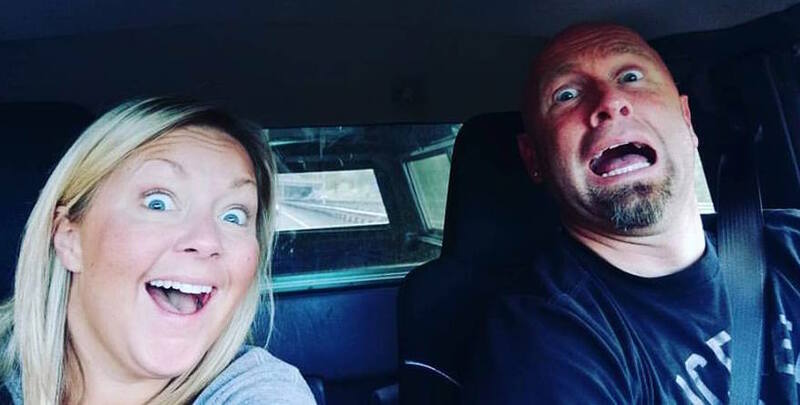 Sooner or later I feared I’d suffer a serious crash that would involve scrapes or broken limbs. I’ve been lucky so far. I’ve suffered only two minor falls. Once wherI got tangled up with the Max tracks and fell over. Another was a low speed, goofball flip over my handle bars that earned me a compliment from a nearby biker but caused no damage. I’ve had my share of wild riding when I’m late for work but I try to be safe. Wikipedia talks about the bikes being set up as roadside memorials where cyclists have been killed or injured. 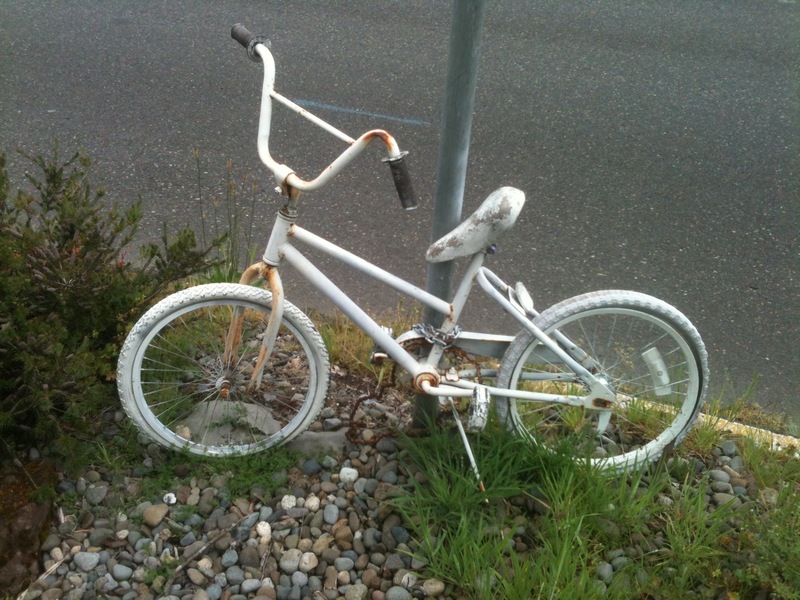 The Willamette Week, in an article from October of 2005, mentioned that the ghost bike project in Portland was started by Forrest Burris to honor his brother Christopher who had been killed on Martin Luther King Blvd. 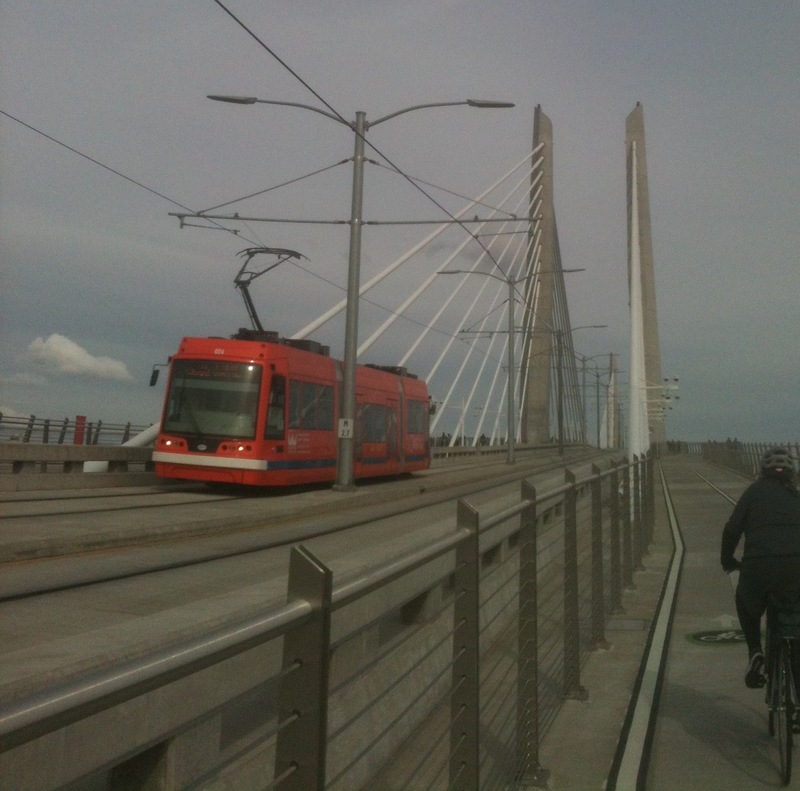 Of course anything and all things bike related are well covered by BikePortland.org. I admit this was about as much research as I was willing to do. 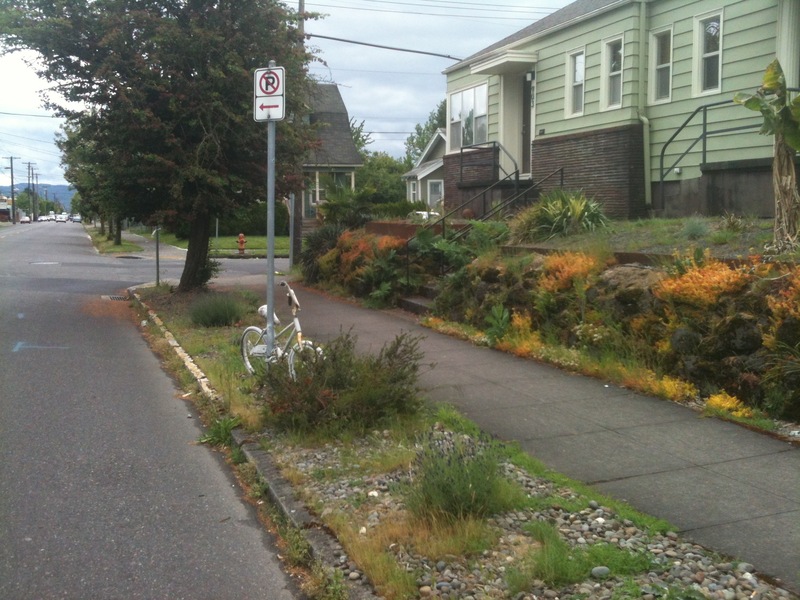 I don’t want to associate a name and details with the ghost bike on Killingsworth. It makes that much more intense. A bike conscious place like Portland provides bike lanes and bike corridors that create the means for a alternative transportation system. I’m hoping people driving in cars and riding on bikes take time to consider the ghost bike. It’s a worthy reminder if it helps people slow down and be a tiny bit safer. 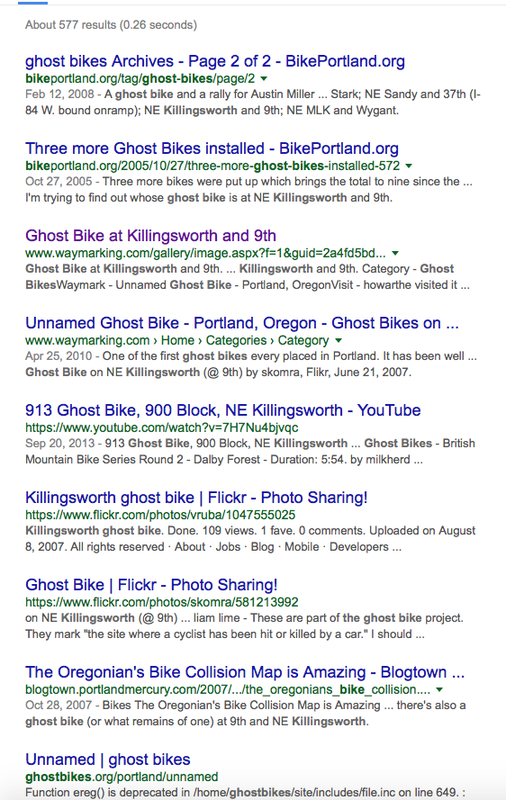 While looking online for ghost bike information, I was struck by a link that led to a list of people who had been killed on bikes in Portland. It was a stark reminder of the risks of cycling. It had me considering the need to read and obey stop signs and be careful about pulling into and riding with traffic. I hope it makes me more aware of bike riders when I’m driving. The ghost bike is a bit like that “there but for the grace of God go I,” saying. I have to remind myself to steer clear of becoming a roadside memorial. Looking at these pictures I took last spring has the ghost bike doing what it’s supposed to do. It haunts me. 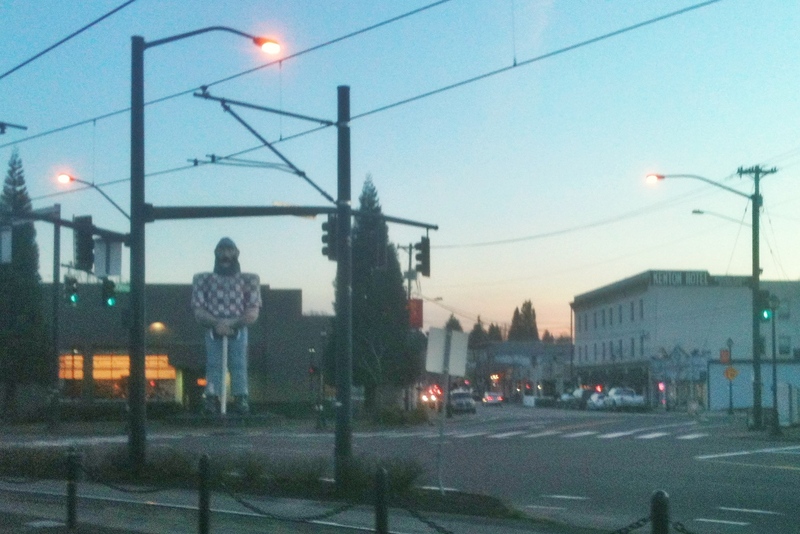 The Portland Orbit reported in April of 2015 that the Paul Bunyan statue in the Kenton neighborhood was due for cleaning. Still it’s likely coincidental that volunteers have assembled and progress is being made to make this happen. In the mean time Paul has been fading away to the point where I worry that he may become translucent. I’ve appreciated Paul for a long time. While visiting Portland in the summer of 2007 I saw the statue which is sure to overwhelm anyone with a roadside attraction gene. It’s not just that he’s now a neighbor, he’s also a terrific landmark. He’s number one, with the Dancing Bear a close second. 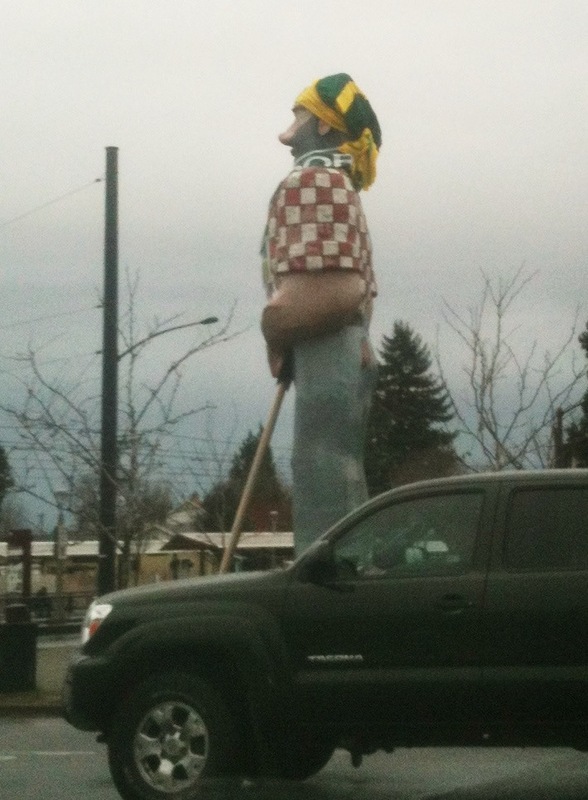 When describing the location of Kenton I mention the Paul Bunyan statue and invariably people have driven past it at some point and they have a sense of where I live. It’s not only the sooty grime and faded and peeling paint that needs attention. Paul may also be suffering from structural damage. The dude was born in 1959 so he has some old bones. All of this is going to take some dinero. Thanks to some amazing volunteer work a committee has put together a fundraising site to raise money. 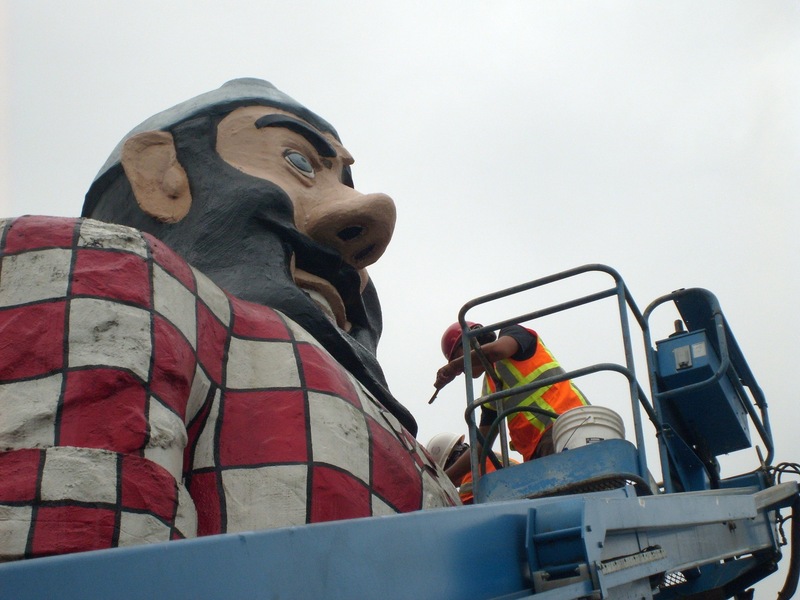 Along with background information about the project, the web site includes old photographs of Paul Bunyan through the years. I’m hoping it inspires people to kick in a few bucks to bring Paul back from the brink of becoming the world’s largest invisible man statue.